A Survey of Language Awareness and Foreign Language Taster Courses was prepared for the web by Derek Gillard and uploaded on 24 September 2012. © Crown copyright material is reproduced with the permission of the Controller of HMSO and the Queen's Printer for Scotland. This Report may be reproduced in whole, or in part, provided that the source and its date are stated. However, it may not be used in, or in connection with, a prospectus or an advertisement or for any commercial purpose. Copies of this Report may be obtained from the Department of Education and Science, Publications Despatch Centre, Honeypot Lane, Stanmore, Middlesex HA7 1AZ. 1. Since the early 1980s the concept of language awareness has stimulated widespread interest in schools, teacher training establishments and professional bodies concerned with language in education. In a growing number of publications, a case has been made for including language awareness in the curriculum. In foreign languages and to a lesser extent in English and in classics, schools have developed teaching materials for language awareness work. At the same time new forms of provision emerged in which language awareness work was often associated with foreign language taster courses. 2. Neither language awareness nor language taster courses proved easy terms to define. The most common definition of the former in the schools' own schemes of work was "a person's sensitivity to and awareness of language and its role in human life". In practice, the concept was loosely and inconsistently defined and served many aims. These are described and categorised in paragraph 32. 3. Foreign language taster courses could be identified on two main criteria. First, pupils studied two or more foreign languages in the time normally allocated to one, so that a continuous experience in one language was replaced by shorter experiences of a variety of languages. Second, the course led to choices of first and/or second foreign language. 4. An important element in many language awareness courses was a series of one-off lessons designed to illustrate the variety of world languages, to give a glimpse of different grammars, scripts and sound systems. There was no intention to teach an active mastery of these languages or to provide pupils with a basis for choosing one or more of them for further study. This type of lesson is referred to in the survey as a foreign language sampler. 5. This survey was concerned with the quality of provision in language awareness, taster courses and samplers, and with the connections between them. It was planned in 1987, with four main aims: to establish how many English secondary schools were involved in language awareness and/or taster courses and their geographical distribution; to assess the organisation of such work within the curriculum; to comment on its impact on foreign language learning; and to evaluate the outcomes for pupils. 6. The central focus was on modern language departments in the 11-16 age range. Although some classics lessons were seen, no systematic coverage was planned of curricular developments in classics intended to promote awareness of language. However, some schools were included in which language awareness was exclusively or mainly the concern of the English department or was a cross-curricular initiative. 7. A summary of the main characteristics of the schools is at Appendix A and Appendix B. 8. The number of language awareness courses in English secondary schools trebled between 1984 and 1988. Even so, fewer than ten per cent of all secondary schools in England were involved in such work. At the time of the survey these schools were concentrated in an area roughly between London, Birmingham and Sheffield, with a relatively thin scatter elsewhere. Much of the increase was in urban, multi-ethnic areas. 9. Language awareness proved to be an umbrella term grouping together a multiplicity of courses which varied enormously in aims, content, methods and quality. The aims reflected and were in a sense limited by the location and catchment areas of the schools. Outside the urban, multi-ethnic schools, for example, courses were rarely designed to make pupils aware of world languages or of the extent to which Britain is a multi-lingual society. 10. The quality of pupils' learning varied considerably. The best provision helped the pupils to acquire valid information about languages and some insight into linguistic pattern and variation by methods which involved them in direct observation and active thinking. Often, however, the pupils had brief or episodic contact with concepts which they did not fully understand or learn to apply. This was sometimes due to defects in the materials and sometimes to deficiencies in the expertise of teachers, few of whom had any formal training in the analysis of language. 11. Language awareness was rarely part of a common approach to language for all pupils. Indeed it was sometimes used as filler for the least able, a stimulus for the ablest or a stop-gap for those who opted out of a modern language. A common approach to language was inhibited by lack of coordination between different subject departments. Dialogue between English and modern language teachers was restricted, and at the institutional level only one of the 36 schools had an effective policy on language across the curriculum. Yet in learning about language, as the Kingman Committee and the National Curriculum English Working Group have pointed out, the pupils are likely to gain from close cooperation between all the departments concerned with language teaching. satisfactory lessons failed to compensate for the lack of a well structured programme capable of developing pupils' awareness of language in a sustained manner. 13. Evidence of the impact of language awareness activities on achievement in modern languages in the survey schools was mixed. On the face of it the skills and ideas taught in some schools had potential for transfer to the pupils' learning of foreign languages, but direct evidence of this was rare in observation of classroom work. 14. Language awareness activities had positive but slight effects on pupils' attitudes towards language, language learning and speakers of other languages. However, these effects were not easily separable from other factors such as the quality of the school's foreign language teaching and the wider institutional climate. 15. Many language awareness courses in the survey included samplers. When well taught, these played a valuable part in promoting insight into linguistic structure and variety, thus helping to achieve some of the cognitive and linguistic aims of language awareness. 16. Foreign language taster courses were diverse in structure, intent and effectiveness. Some had no connection whatever with language awareness and simply sought to provide pupils with a basis for choosing the first foreign language. Short, straightforwardly structured courses of this type operated effectively and were consistent with the policy of diversification. 17. However, taster courses were frequently associated with language awareness especially in areas where a means was sought to introduce ethnic community languages alongside the traditionally taught modern languages in the entry year to the secondary school. A modular structure was commonly used for this purpose, combining a module of language awareness with taster modules in several languages. 18. A substantial number of these courses offered a fragmented experience in too many languages, and limited progression and thin experience in any one language, which over two years provided a wholly inadequate base for mastering communicative skills. At the same time the links between the taster modules and the language awareness module were generally weak. quality of the courses as a whole was less satisfactory than the work in individual lessons suggested. 20. The quality of the work did not correlate in any way with the location of the schools or the extent of bilingualism in their intakes: it ranged from poor to good across each of the sub-groups in the sample. Just under 30% of the lessons were unsatisfactory or poor. The remainder were satisfactory and a few were very good. 21. The poorer lessons exhibited various combinations of weak features which inhibited systematic thinking by pupils about their own experience as language users. Some put excessive emphasis on the presentation of factual information such as details of the articulatory tract. Some used remote and complex information to illustrate ideas which could have been established more simply: the notion that languages change, for instance, was too often tackled through charts of the emergence of Romance and Germanic language families from Indo-European. This was generally ill-adapted to mixed-ability classes of pupils aged 11 or 12 who had not yet learnt any foreign language. Other lessons took broad concepts such as "communication" at too general a level and moved too quickly through loosely connected examples, leaving pupils confused. Topics such as grammar and the functions of language were often too abstractly presented to be effective. In other cases the content was poorly aligned with the school's own aims for language awareness. 22. The level of the work set was sometimes too low even where language awareness was offered only to the less able, so that, for example, the potentially rich topic of signs and symbols degenerated into copying road-signs. Many of these unsatisfactory lessons gave the pupils too little scope for talk or practical activity. Another problem was that of weaknesses in the teacher's own knowledge. This led at times to pupils acquiring superficial, inadequate or even fallacious concepts, or to the ignoring of correct and sometimes significant observations by pupils which if developed could have added interest and depth to the treatment of a topic. 23. Almost all language awareness work was taught by graduates in modern languages, classics or English, few of whom had any special training in linguistics. Most had acquired the knowledge needed to plan and teach a language awareness course from their own reading. A few recent graduates drew on ideas and reading from courses on language which they had attended during their postgraduate teacher training. A lack of expertise was evident in the planning and teaching of certain topics, such as phonetics or, more broadly, spoken rather than written language. Staff insecure in their knowledge were often overdependent on published materials and sometimes unable to modify these so as to present a complex topic in straightforward language. 24. The good lessons dealt with a wide range of topics including non-verbal communication, aspects of grammar, morphology, writing systems, language change and social variation in language. The best of them had clear objectives, gave pupils opportunities to participate actively in the lesson and through this helped them to become aware of a significant point about language in an atmosphere which stimulated personal response and curiosity. The next two paragraphs illustrate these points in greater detail. 25. In a Year 7* class, some of the French words practised in the first part of the lesson became the starting point for a reflection on the relationship between words and things. The French, German and English words for various animals and objects illustrated the idea that words are arbitrary labels. This was taken further by assigning meanings to nonsense syllables. Amid lively discussion, pupils arrived at the insight that the meanings of words have to be agreed by the speakers of a language. Group work followed, in which pupils had to agree a limited vocabulary for a "new" language and translated some English sentences into it. The lesson caught the interest of the pupils. 26. In another Year 7 lesson, the teacher explained the arbitrariness and variety of body language signals in different cultures. These were then illustrated in a series of pictures. In each case the pupils were asked to state in words the message of the gesture and to suggest why body language was being used. This led to much humour but some very precise use of spoken English as well. Finally the pupils worked in groups of five to produce a sketch using body language to make or underline points. These were done with verve, with good use of facial expressions, posture and gestures to clarify, caricature, or give an ironic commentary on the spoken dialogue of the sketch. The lesson was firmly structured but left room for independent and creative work within the tasks set; the pupils were extended and enjoyed the work. *This refers to secondary school pupils aged 11-12. Correspondingly, Year 8 refers to pupils aged 12-13, Year 9 to pupils aged 13-14, Year 10 to pupils aged 14-15, and Year 11 to pupils aged 15-16.
scripts, sound systems and etymologies, some pupils were picking up habits of observation and classification and dictionary skills which seemed likely to transfer to their language learning. The analytic approach to word formation and sentence structure developed in a few classics and modern language courses in language awareness was clearly equipping some pupils to work out the meaning of unfamiliar compound words and to recognise and label structural relationships. In a few lessons, it was possible to observe directly an effect on attitudes, for instance in the status given to two Greek speakers when they were asked to help with a role-play in which two fluent speakers of a language other than English were essential. 28. The teaching and learning style of these stronger lessons was generally participative, with a good deal of pair and group work, some role-play and mime and problem-solving. As an example of the latter, pupils were asked to explain how they could manage to understand quite a high proportion of a few sentences in a language they had not yet learned. This led to discussion of the clues that listeners use to make sense of what they hear. Good use was also made of the languages spoken by pupils in the class, the school and the local community, both to signify that these languages were noticed and valued and to inform all pupils of the variety of languages spoken within the school and in its catchment area. 29. The range of material resources used to develop language awareness varied between schools but there was a strong common core based on four or five books and to a lesser extent on BBC publications. These provided a framework which led to very similar patterns of work in quite dissimilar schools. Too many courses depended almost entirely on photocopied worksheets. The best work tended to occur in schools which had developed or assembled their own materials to support their individual scheme of work. It was uncommon to find audio or video recordings which allowed points about language to emerge from direct observation. 30. This deficiency was highlighted by the good practice in a few schools where a wider range of resources had been assembled, adding variety to the course and putting more emphasis on first-hand experience. In two schools Braille materials were introduced to give pupils an insight into reading by the visually handicapped and in another pupils interviewed a blind person. In one school, work on different scripts included extracts from newspapers in Arabic, Urdu and other languages and suggested follow-up reading on the history of writing. cases it was regarded as a form of remediation. On the other hand, one English department offered a language awareness course to all pupils except the least able. In another school, language awareness was regarded as a form of mind-stretching for the top two language sets. After the entry year, a language awareness course was sometimes offered to pupils in Year 9, Year 10 or Year 11 who had opted out of the second or even the first foreign language. 32. The aims of language awareness as stated in the schools' schemes of work fell into three main categories: cognitive, linguistic and social. The cognitive aim was to give pupils knowledge about language and insight into its forms and structures, so that they would become more conscious users of their mother tongue and more conscious learners of second or foreign languages. The linguistic aims were to do with skills or competence: thus some language awareness courses were intended to improve the pupils' spoken or written English, others to teach grammatical terms or to develop more general language learning skills. The social aims had several strands including, for example, developing positive attitudes towards cultural diversity, enhancing the self-esteem of pupils for whom English is a second language, and promoting the value of bilingualism. 33. The extent to which these aims were achieved depended not only on the expertise of staff but also on the match between aims and course content. This varied from poor to excellent. The poorer examples too often had impressive aims some of which had no recognisable connection with the topics or materials. In one school in which the language awareness course replaced the learning of a modern language for a whole year, the aims included motivating pupils to learn languages and equipping them with the necessary skills. Yet the course included no experience, however brief, of a language other than English nor any discussion of how first or second languages are learned. In contrast, a London school which saw language awareness mainly as an introduction to language learning had devised clear, attractive units of work on language structure which drew examples not only from English and Chinese, but from French and spanish which were to be studied later in the year. This material was sufficiently concrete for pupils to grasp the concepts readily. 34. Sometimes, however, the conceptual level of the material and the terminology used were poorly adapted to the age or ability range of the class. One course lasting two terms was for pupils with special educational needs whose language problems were such that they were thought incapable of beginning French. The course - essentially one in elementary linguistics - was more taxing conceptually and linguistically than a first year French course. Other problems included excessively detailed information on topics such as language families or the history of English. 35. The quality of planning was variable, partly because many of the courses were recent and experimental. Many schemes were superficial, aiming more at creating a positive disposition towards language learning than establishing sound concepts. Some gave glimpses of very broad notions such as "body language" but avoided topics which required pupils to observe or analyse English or another language. Others touched on language structure, but unsystematically, with traditional descriptions of "parts of speech" or, in some cases, confusing accounts of gender before pupils had encountered gender in French or German. 36. Nevertheless, about half the schemes of work were satisfactory and a few were of high quality. These were in schools where language awareness work was not a stopgap but an integral part of the languages provision. In one school, clear objectives were set for the "introduction to language" course which all pupils did in their first half term; lesson notes for staff gave suggestions for resources, activities and starting points rather than information to be conveyed; the schemes for French and Spanish defined objectives in terms of skills, attitudes, concepts and content, and the entries under "concepts" showed how the cognitive and linguistic aims of language awareness might be realised directly through learning French and Spanish. 37. The structure of the language awareness courses was strikingly diverse and examples of different patterns of provision are given at Appendix C. It was clear that some structures worked against the aim of improving foreign language learning. Where language awareness lessons were formally separate from foreign language lessons, each tended to develop its own agenda with relatively little cross-reference or transfer. At the extreme, the time allocation for language awareness was excessive, as with one course which occupied four periods a week throughout the first year and was taught instead of French. There were no detectable gains in the depth or quality of language awareness work from this extra time and the pupils lost a whole year's learning of a modern language. pupils with the habit of analysis and a vocabulary for discussing language which older pupils appeared to be applying to their modern language learning. This effect was not observed in other schools. 39. The majority of the language awareness courses in the survey were taught by modern language teachers. By and large few productive links had been established with English staff despite the potential for collaboration in teaching about language. It was clear from interviews that in nine schools English staff had little interest in language awareness work. In ten others, they supported the principle but had no involvement in practice. In the rest, English teachers were wary: there was, in the words of one head of English, "a dialogue, but not a meeting of minds". This was generally because of a resistance to what was thought of as the "analytic" approach to language implied by language awareness. In only one school was there a policy on language across the curriculum. In schools where the English department ran a language awareness course, there were few examples of good collaboration with modern languages, and where both departments were involved there were sometimes considerable overlaps, not always recognised, in the content of the English and modern languages courses. 40. Samplers and taster courses were observed in 11 languages: Chinese, Czech, French, German, Hindi, Latin, Panjabi, Russian, Spanish, Turkish and Urdu. Of the 36 lessons seen, nine were unsatisfactory, 15 were satisfactory and 12 were good. The following paragraphs assess the quality of these two distinct strands of work and of the modular structures with which taster courses in particular were often associated. 41. It is worth citing three examples to illustrate the range of practice and outcomes in sampler lessons. In one course a low ability set of 17 Year 7 pupils had two lessons of Latin as part of their "introduction to language" in term 1. The first of these lessons, based on a Latin text read and translated by the teacher and on exercises from a Latin course book, was poorly matched to the abilities and interests of the class. The pupils' participation was limited to guessing the meaning of some words and filling in blanks in written sentences. written work on chinese characters, developing from the previous lesson and referring back to an earlier module on different scripts. The pupils were shown a Chinese newspaper and writing primer, and a Chinese ink block which they were to try the following week. They were also told how the Chinese learn to write. In this way the class was developing some insight into Chinese by hearing, speaking and writing the language and learning something of its cultural context through use of authentic materials. 43. In an inner-city comprehensive school the first term language awareness course was rounded off by a one-hour sampler in Czech, taught with the help of a Czech-speaking parent and her two daughters. The Czech dialogue was repeated and gradually broken down into perceptible units which the pupils repeated, practised in pairs, and then consolidated in groups of five, three led by native speakers, one by the class teacher and one by the head of department. This remarkable ratio of teachers to pupils ensured that each group practised the material intensively for twenty minutes. Finally, ten pupils (in pairs) reproduced as much of the dialogue as they could recall. Recall and pronunciation were generally good. Almost all were using the inflected case-ending (as in "Sheffieldu") without any formal explanation of it. The lesson was conducted at a brisk pace and was much enjoyed. This experience of Czech was used to get pupils to think about basic skills and attitudes needed for language learning, forming a clear link between the language awareness syllabus and the learning of French on which they were about to embark. 44. Samplers were usually taught by staff who spoke or had a working knowledge of the language concerned. Some schools made full use of the less usual foreign languages spoken by the staff, and others drew in parents to extend the range. This worked well where the material used and the conduct of the lesson were jointly handled by the parent and the qualified language teacher. 45. In general sampler lessons were clearly linked to the language awareness courses of which they were part. The evidence suggested that these brief contacts with actual languages were enjoyed by pupils and helped them to form some idea of how languages vary and how they are structured. pronounce adequately the few words they knew. In some cases these problems related to the use of non-specialist or untrained staff. This was associated in turn with undue use of English in the classroom and with weaknesses in methodology. 47. Taster courses in community languages such as Greek, Hindi, Panjabi, Turkish and Urdu were sometimes effective and enjoyed by the pupils but in a number of schools two distinct sets of problems occurred. First, the teachers were generally faced with classes varying greatly in ability, language competence and motivation. A small Turkish class consisted of two pupils who spoke Turkish, one whose mother was Turkish but whose knowledge was very limited, and a complete beginner. A Greek class contained four beginners for whom it was a foreign language and three pupils already fluent. A Hindi class of 18 pupils contained nine who spoke Hindi, Panjabi or Urdu which are closely related languages, and nine who had no such language background. Even with small classes it was difficult to manage such a range of learning needs effectively. One lesson was relatively successful by virtue of pairing native speakers and non-native speakers for simple dialogue practice and by emphasising cultural context, which was explained in English to involve the non-native speakers. In general, however, it was clear that the pupils' interests conflicted. Taster courses designed to provide a basis of knowledge on which to build were difficult to implement where there was a mix of native and non-native speakers. Conversely, some of the most effective lessons occurred where these languages were taught as foreign languages to classes containing few if any native speakers. 48. The second set of problems arose from materials and methodology. A number of lessons in community languages were dull in content and materials and took place in a restless atmosphere. Oral work in one lesson was confined to excessive repetition of isolated words, and in another to the translation into English of words or phrases of the type "my wife's sister's husband". Written work generally consisted of drawing and labelling, blank-filling exercises or the copying of phonetic transcriptions. In one class consisting entirely of native and near-native speakers, the only written activity was to copy script into exercise books. In schools where several lessons were seen with different year groups, there were worrying indications of repetitiveness of content and lack of progression in the pupils' language skills. context; and another combined a Bengali taster course with a broader study of the geography and culture of Bangladesh. 50. In some LEAs, peripatetic teachers of community languages contributed successfully to taster courses though not all had the training or skills necessary to do the work well. However, three trained modern linguists who had learned a community language as a foreign language were able to teach it effectively as a taster course. 51. Across the whole range of languages one in three taster course lessons was successful in teaching language skills and in attracting and motivating the pupils. These lessons were characterised by firm confident teaching, consistent use of the foreign language, good use of real objects, visual aids and authentic documents such as town plans, a well-balanced mix of teacher-led question/answer work and practice in pairs or small groups, and the attention given to culture as well as language. 52. The strongest lessons were indistinguishable from good language lessons taught within a more conventional framework. A German class taught by a native speaker had excellent pace and variety. German was used throughout and carefully graded questions led to systematic practice of a new grammatical structure as well as consolidation of material taught in earlier lessons. The pupils joined in confidently, using what they knew accurately and fluently and pronouncing it well. This was part of a six week taster course in German, to be followed by one of similar length in French, after which the pupils would choose to continue with one or the other. Indications were that the good relationships and sense of competence established in German taster course classes were successfully attracting good numbers to opt for German. 53. The basic types of taster course encountered in the survey are summarised at Appendix D. Many had a modular structure, dividing the year for example into five modules of seven or eight weeks, and pupils studied language awareness and four languages in rotation. In the language modules, the pupils encountered greetings, numbers, everyday phrases and some simple vocabulary in each language in turn. There was no progression of learning from one module to the next and planned links between the language awareness module and the language modules were rare. Some modular courses extended over two years, or even longer, reducing the total learning time available for any one language to excessively low levels. A detailed example is given at Appendix D.
pupils in European languages and of offering community language taster courses at too low a level for those pupils who already spoke them. A modular framework which was too fragmented or too prolonged failed to provide a good foundation for language learning. More compressed modular structures incorporating a maximum of two or three taster courses were better, especially when language awareness work was interwoven with or arose from the taster courses rather than having a separate block of time. 55. In a few schools, complex arrangements of modules in the taster courses led to an unhelpful deployment of staff, in which modules were taught by non-specialist teachers, adversely affecting the quality of the work. Similarly the variety of implicit messages about language-learning as pupils passed from one taster module to another caused confusion when four or five different teachers were involved in poorly coordinated schemes. There was less fragmentation for the pupils when one teacher taught a all or a substantial proportion of the course. Departments staffed with modern linguists competent in two languages were able to do this. With some training or self-tuition double linguists were able to teach a first year taster course in a third language with little loss in quality. 56. Interviews were held in 30 schools with small groups of pupils in order to gauge their attitudes to language, language-learning, speakers of other languages and their experience of language awareness or taster courses. In all 238 pupils were interviewed. In addition, pupils in ten of the schools wrote freely about their recollections of and reactions to their language awareness and/or taster courses. This limited evidence needs to be interpreted cautiously. 57. Over half the interviews indicated that a language awareness course had stimulated curiosity about or interest in language. Pupils were attracted by an approach to language which was in general distinct from what they experienced in English or French lessons. This was partly a response to new information or exotic content: pupils recalled work on animal language, hieroglyphics or Aztec more readily than work on language structures. Beyond this novelty effect, other pupils in just a few schools said they had enjoyed the challenge of spotting a grammatical pattern or seeing connections between words in different languages. cases the pupils' attitudes could equally well have been influenced by strong teaching in modern languages. 59. There was evidence of respect for speakers of other languages, despite some clear individual instances of more negative attitudes. Again, however, this effect could not be directly attributed to language awareness activities since it tended to reflect the wider institutional climate. In an inner-city school where pupils from many different language groups worked together with a high degree of mutual understanding, the language awareness course was one element of a curricular design which accorded high status to foreign and community languages and English as a second language. The school's structures and paperwork constantly reinforced messages about the value of bilingualism. The school diary, for example, had sections printed in Arabic, Bengali and other languages, and newsletters were printed in different languages. Pupils emphasised in interviews that it was difficult not to accept bilingualism in a school in which you constantly heard your peers converse in Arabic, Bengali, cantonese, Spanish and other languages. 60. Pupils' attitudes to language awareness and taster courses were largely but not wholly positive. Negative reactions related in some cases to poorly structured or poorly taught courses. Discounting these, the most interesting findings concerned the relationship between language awareness work and actual language learning. Pupils generally felt that courses designed to prepare them for foreign language learning were too long if they lasted more than four weeks. Pupils recalling language awareness courses frequently had vivid recollections of the sampler elements and much hazier ones of the language awareness content. Where less able pupils were doing language awareness as a substitute for the supposedly harder task of learning French or German, they generally claimed to regret it. 61. Pupils interviewed and those observed in classrooms did not all give convincing signs of conscious awareness of language or of sensitivity to it. Of those who did, some were aware of language in the sense of being informed about it. Where surveys had been carried out by the class, the pupils often knew which languages were spoken at the school or in the local community. From making bar graphs of world languages, they were often aware of the range of languages spoken in or beyond Europe. This widening of perspective was generally associated with urban multi-ethnic schools. Pupils in rural schools usually had little or no knowledge of the range of languages spoken in Britain or the world. pupils who had completed the course. This was less true of work on scripts, where pupils retained strong visual impressions and the general idea of widely varying systems. 63. Some language awareness courses were helping to develop social sensitivities to language and through this a degree of understanding for speakers of languages other than English. The insight caught in the question from one pupil to another: "Do you really speak Urdu at home? It may have marked the beginning of a learning process. 64.· The rapid extension of language awareness and foreign language taster courses in the mid-1980s grew from the conviction that pupils had much to gain from the study of language and from exposure to a variety of foreign languages. However, the lack of definition of the term "awareness" led to very great variability in the aims, content and structure of the courses sampled in the survey. 65. The quality of these courses ranged just as widely. There were positive gains in knowledge, insight and attitudes for some pupils in certain language awareness lessons, but these were generally too slight to justify the time spent on the course. Many courses in language awareness were superficial and had no clear rationale for developing the pupils' understanding of language. Outcomes were generally thought of in terms of attitudes but rarely in terms of specific concepts, knowledge or skills. 66. Only in one school was it possible to detect clear-cut benefits for foreign language learning which could be attributed with reasonable confidence to language awareness work. Pupils in most schools saw these two activities as quite distinct and there was little evidence that teachers referred to language awareness work in the course of foreign language lessons. There were no indications that language awareness courses generally accelerated the rate of subsequent or parallel language learning; indeed the pace and style of the foreign language lessons in the schools which taught language awareness was not distinctive in any way. Some forms of modular foreign language taster course led to a watered down and fragmented experience of language learning which severely compromised standards of achievement in the first two or three years of the secondary school. English, but this should be integral to the learning of the target language, not separate from it. APPENDIX B: THE SELECTION OF THE SURVEY SCHOOLS. 1. In the summer term 1987 a questionnaire was sent to all English Local Education Authorities (LEAs) asking them to update the information which many had provided for the only previous survey on language in schools, conducted between 1982 and 1984 by a working party of the National Congress on Languages in Education (NCLE). A number of trends were evident in the LEA responses. 2. Numerically, 339 secondary schools were said to be offering some form of language awareness course. This was a marked increase compared with the earlier survey, but just under 10% of the total of maintained secondary schools in England in 1987. Geographically, the bulk of the schools teaching language awareness were in an area roughly bounded by London in the south, Birmingham in the west and Sheffield in the north, in predominantly urban authorities. The distribution of taster courses was similar, but not identical. Over half the schools had both, and just under half had language awareness with no taster course, or less commonly, a taster course with no language awareness element. 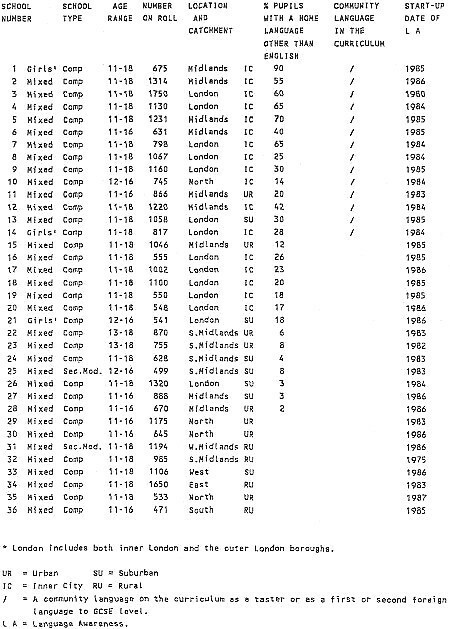 Only a handful of schools were recorded as having initiated either type of course before 1982. 3. These features helped to shape the selection of the sample of 36 schools from the 339 identified through the questionnaire. 4. Two thirds of the schools selected were in metropolitan districts and one third in shire counties. As the table at Appendix A suggests, the schools could be roughly arranged on a scale based on location, the percentage of pupils having a home language other than English, and the inclusion of a community language in the curriculum. At one end of the scale were inner city schools with high proportions of pupils whose first language was not English, and one or more community languages in the curriculum. At the other end of the scale were schools with mainly suburban or rural catchment areas, all or virtually all pupils from monolingual English-speaking families, and the languages in the curriculum confined to French, German, Spanish and Latin. Between these extremes were urban multi-ethnic schools in which many different home languages were spoken by pupils, the range running from three to 72. The rationale for language awareness and the use made of taster courses and samplers varied in accordance with the school's place on the scale in a reasonably consistent way, reflecting the efforts made by staff to devise a curriculum responsive to local needs. 5. sixteen of the 36 schools had a language awareness course with no foreign language taster course; 20 had some combination of the two. 1. Almost all courses were run by modern language or English departments from their own time. The time devoted to language awareness was generally between 15% and 40% of the subject allocation. These courses had the shape of a block, a string or a wedge. Blocks varied in length from two weeks to a whole term, usually the Autumn term, and were intended to lay the foundation for foreign language learning. Strings ran through the whole year, generally taking one out of four or five periods a week. A danger with both patterns was the formal separation of language awareness work from language learning. The wedge-shaped course being piloted in a few schools was more successful in connecting language learning with learning about language. In this structure foreign language time was mainly devoted to language awareness activities at the outset but this decreased progressively as more time was given to learning French or German, and the flexible allocation of lesson time between the two activities allowed valuable cross-referencing and mutual reinforcement. 2. A few courses were cross-curricular. They were widely different in structure and timetabling. For example, one occurred outside subject time as part of the first-year programme of personal, social and vocational education (PSVE). It achieved its objective satisfactorily in the equivalent of two periods a week over half the school year at no expense to English or languages. Another school used all the teaching time from English, French, history, RE and music, ie one third of the whole timetable, in a four-week block at the beginning of the year. The benefits of this were difficult to detect in the pupils' work. APPENDIX D: THE STRUCTURE OF FOREIGN LANGUAGE TASTER COURSES. i. A number of modules between one and six weeks long in up to four languages leading to a choice of one of these as the first foreign language at some point in Year 7; in some variants two languages were selected from three or four and were given equal emphasis in years 8 and 9.
ii. Modules of varying length and structure taken from the time available for the first foreign language in Year 9 and designed to give a basis for choosing a second foreign language in Year 10.
iii. Modules of 10 to 12 weeks in three different languages in Year 7, repeated in the same order in Year 8 with the intention of providing progression and a basis for choosing the first foreign language or, for some pupils, the second foreign language to be studied in Year 9. 2. The simplest structures were those in which two foreign languages were studied in successive terms or half terms, and a choice was then made between them, after which the chosen language was followed through to GCSE level. There were only three courses of this type. None had difficulty in securing a reasonable balance between the two languages following the pupils' choices. Observation suggested that a six-week taster course in each language in term 1 conducted at a brisk tempo provided as good a basis for choice as one spread over two terms. 3. The length of such courses varied from a term to over two years. In one school which allocated three periods a week to languages in Year 7 and four periods in Year 8 and Year 9, the rotation of language awareness, French, Panjabi, Spanish, and Urdu was repeated in Year 8. In Year 9, all pupils did two periods a week of French but the other two were again broken into short modules of language awareness, Punjabi, Spanish and Urdu. Hence a pupil reaching the end of Year 9 would have had at most 118 35 minute periods of French or roughly 59 hours of contact time spread over three years. This is less than a quarter of the length of the normal course of four 35 minute periods a week or its equivalent. Panjabi, Spanish and Urdu fared much worse. This thinness of experience was wholly inadequate as a basis for mastering practical language skills.